I got the new issue of Aperture the other day and it's one the couple of issues a years that's actually worth getting - with several good articles in it. 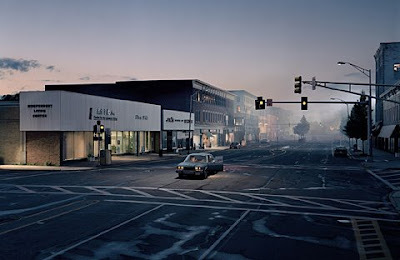 I also just finished watching the last of the BBC series - The Genius of Photography (very good overall BTW) - in which Crewdson is featured - working on the picture below, among others. 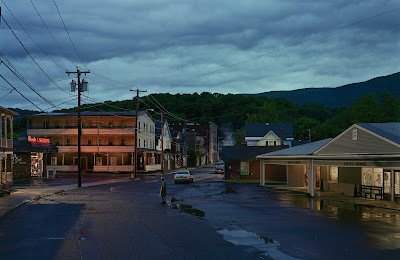 Needless to say I do quite enjoy Crewdson's work. It doesn't quite bowl me over in the same way as the work of certain other photographers, but it holds my attention and causes me to think. I enjoy what he does and how how it looks. "On Main Street, Pittsfield Massachusetts lights are being rigged, props are being positioned and actors are taking their places. 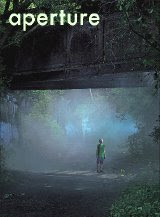 It looks like a movie, sounds like a movie and smells like a movie, but it isn't. 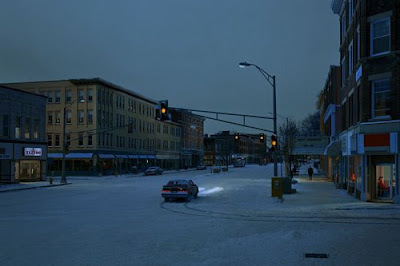 All of this activity is to make a single photograph, by Gregory Crewdson. Over an 11 day shoot in a variety of locations Crewdson's team will make a series of multiple exposures which will be digitally combined to make six final images. He'll produce an edition of six prints of each image priced at approximately $60,000. There's already a list of prospective buyers. And I guess what surprises me is that - well, it surprises me. I find it a little hard to comprehend how someone can get worked up about how Crewdson produces his pictures rather than the pictures themselves. Love them or hate them (or be indifferent) - but that he has someone click the shutter for him - so what? One final bit of analysis of Crewdson and his work - it has obvious links with cinema, and in some ways with the early proto-cinematic photography of Muybridge - someone who didn't think twice about having a whole crew assist him in his project. the "genius of photography" quote come from the episode about how the art world has recently fallen in love with photography "very different from the experience of earlier generations". which includes of course alec sloth and a whole host of all the other big money players. certaily i'd like to see crewson make those images on a social security cheque, so i'm no so sure that the image itself is "the point" any more, certainly in this context. 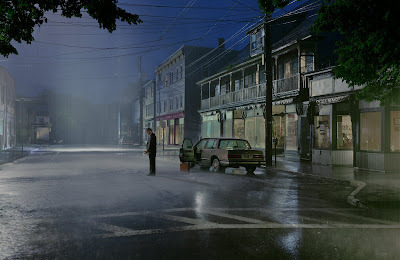 I'm annoyed by Crewdson not as a photographer but as a movie lover. He takes the techniques, ideas and images of the most democratic form of art in history and uses them to make these dreary images which are available only to those who have 60 grand laying around. 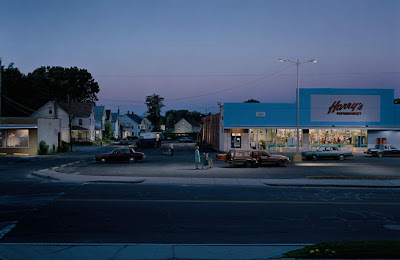 I think of the authorship issues surrounding Crewdson as having been resolved eons ago, certainly by Leonardo's time, and played far more astutely to the artist's advantage contemporarily by Warhol. Problem with the cinematic approach are very similar to those faced by movie studios. Oscillations in photography between the soloist/low production value approach, and the total-control high-zoot team efforts have played themselves out several times in history. This type of work tends to yield results that are overtly paralyzed in time. 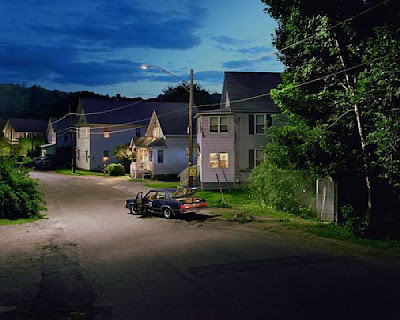 Crewdson's work is not alone in its rigorous morbidity. Jeff Wall's Outside a Nightclub 2004-2005, is to a street scene as a frozen turkey is to one in the forest. Fortunately, champagne does not improve according to the size of the bottle.